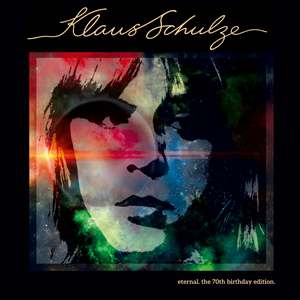 Double-CD on the occasion of Klaus’ 70th birthday. MIG proudly presents several gems of typical Schulze works. CD 1: a complete previously unreleased album. CD 2: rare tracks, once released in a very limited number at Music fairs. CD 1 contains a complete previously unreleased album, recorded by Klaus around year 2006/2007. On CD 2 we find with the 3 tracks “Schrittmacher”, “Ion/Andromeda” and “Andromeda-The Grand Trance” titles written by Klaus for keyboard manufacturers and shared in very small amounts (300 pcs.) on music fairs. The theme “Andromeda” was released in a different, tight reduced version (Constellation Andromeda 23:52)) as bonus track on the album “Dreams” (MIG 01752 CD). Here you find it in its whole magnificence and hypnotic creed in full length (Ion/Andromeda and Andromeda-The Grand Trance (57:17))! The liner notes were written by no one else but Ecki Stieg (Grenzwellen) and you can read it in the extensive booklet.